Maintaining the integrity of your transfers, your money and your data is our top priority, and we take our responsibilities seriously. We operate a system of fully secured, ring-fenced client accounts, so you can be sure your business will be protected from any outside interference, all funds will be clearly allocated and your accounts will never be compromised. All data stored with us is UK-only; we do not source any cloud hosting or computing services from servers or companies based abroad, and every aspect of our business is subject to and protected by UK laws and regulations. Furthermore, our servers and backup systems are dual-located in separate places, so that in the unlikely event of server compromise, damage or failure, our backup will remain unaffected and your business will keep running as normal. Data protection and GDPR are also vitally important to the secure running of your Direct Debits and customer card payments. Even with the most secure system, you must still take every measure to make sure all information is discrete and confidential. We ensure segregation of SUNs and funds so that your business will be doubly protected from any unauthorised access. For further protection, our security measures are not just digital, and the infrastructure around our physical premises is equally thorough. Precautions include intruder detection and prevention systems, with CCTV, and nobody can enter our offices without a photo ID. We also operate a clear desk policy to close the loop on any accidental physical data breach. Our close attention to security ensures your customer payments are in safe hands. All firms carrying out financial services and activities must be FCA regulated by law, and we are fully compliant in this respect. The FCA issues regular consultation papers, policy statements and updates on everything from digital security to sector best practices, to help the financial services industry protect its clients and provide a comprehensive level of service. You know you won’t be let down by us.  We are able to help a great many businesses with their Direct Debit payments by being a Bacs Approved Bureau. This means we are also subject to the Bacs Approved Bureaux Scheme, and so undergo a regular inspection process to ensure we meet all the standards set by Bacs for good industry security practice, most importantly around confidentiality, integrity and availability. Finally, we are becoming ISO 27001 accredited so that you can be sure our security processes are consistently measured and reviewed in accordance with thorough, industry-wide standards. ISO 27001 is an internationally-recognised set of standards set up to help businesses cover all aspects of information security management, including financial information, personal details, sensitive corporate information and other information entrusted to us by third parties. We have two decades of industry experience and expertise, allowing us to support all your business needs.